Bovine Pulmonary Artery Epithelial (BPAE) cells have been featured several times in the gallery and on our Instagram; incase you missed them, check out Kaleidoskeleton, Plumotion, and Cytoskeleton Four Ways. 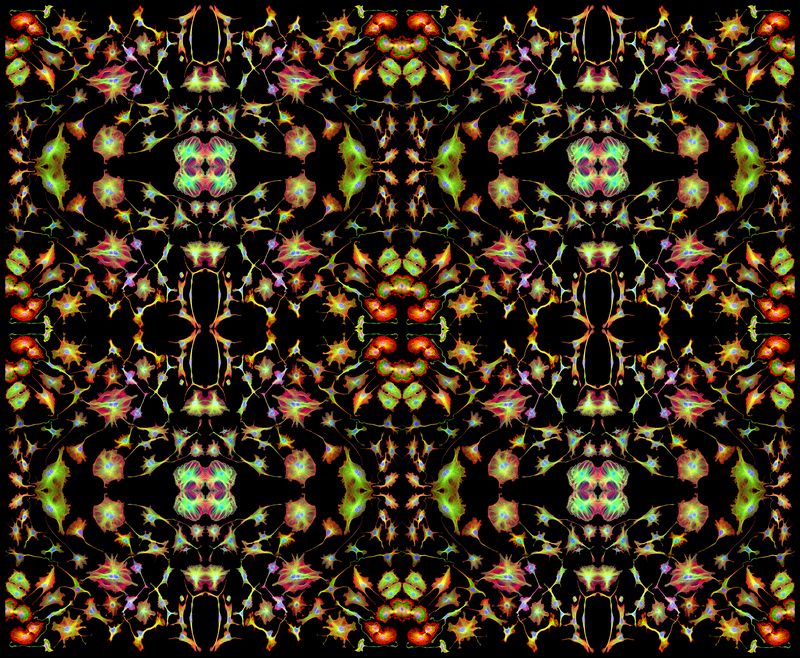 In this stunning collage, BPAE cells and macrophages are artistically stitched in a kaleidoscopic array, their cytoskeletons and nuclei stained several different colors. The cytoskeleton is responsible for essential cell functions including cell division, movement, and trafficking cellular components to precise locations within the cell. Macrophages are important cells in the immune system that help keep the body clean by engulfing parasites and damaged or diseased cells in a process called phagocytosis. Some macrophages appear near the center of this collage and can be recognized by spindle-like extensions of their cytoskeleton, called pseudopodia, stained green (click the image to enlarge it in a new window). Macrophages extend these pseudopodia toward bacteria and then engulf and digest them, or can extend multiple pseudopodia around larger “prey” such as dead cells of the body to eliminate them. To read more about macrophages and other phagocytic cells, click here. To watch a cool video of a macrophage engulfing bacteria, click here. Next Next post: Why is Antarctica’s Ice Sheet Growing in a Warming World?